is a day you’ll never want to forget. When choosing a Wedding Photographer, make sure they will narrate the story of your wedding day through photojournalism, creative lighting techniques, and posing that captures the emotions, hopes, and dreams of you and those you’ve chosen to share your special day. 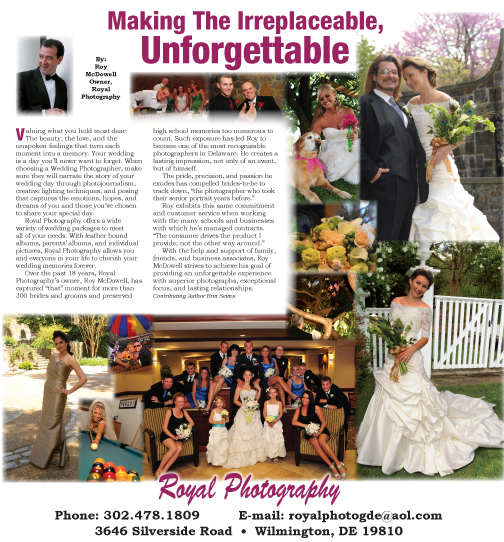 Over the past 18 years, Royal Photography’s owner, Roy McDowell, has captured “that” moment for more than 300 brides and grooms and preserved high school memories too numerous to count. Such exposure has led Roy to become one of the most recognizable photographers in Delaware. He creates a lasting impression, not only of an event, but of himself. Roy exhibits this same commitment and customer service when working with the many schools and businesses with which he’s managed contracts. ← Previous Story Excitement Is In The Air At Lady’s Image! Next Story → What Are YOU Wearing?